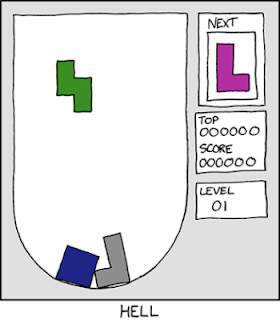 In a week of pentominoes, there is a little game that uses tetrominoes – Tetris. Now, as we have seen, there are 12 free pentominoes. As each pentomino has an area of 5 unit squares, all 12 pentominoes have a combined area of 60 square units. The problem of tiling a rectangle of 60 square units with one each of the 12 pentominoes has numerous solutions. In contrast, there are just 5 free tetrominoes, each obviously has an area of 4 square units. However, it is impossible to tile any rectangle of 20 square units using one each of all 5 tetrominoes.